Armed with the right information, landfill managers can make better decisions that prolong the life of a landfill and use the given space in the most efficient and effective manner. In recent years, landfill executives have been facing mounting pressure. Waste management companies must work with a finite resource: space. And that space is shrinking much faster than previously expected. According to research from the Waste Business Journal, only 15 years’ worth of landfill capacity1 is forecast to remain by 2021, and in some regions, the situation is even more dire. This undesirable situation has been made worse by new regulations from the Chinese government, which has been buying and recycling around 45 percent of the rest of the world’s plastic trash for decades.2 Due to its new National Sword policy, China is now only willing to accept certain types of waste, and several types of plastic scrap will no longer be allowed. The U.S. alone shipped roughly 4,000 shipping containers’ worth of plastic to China each day.3 With the new regulations in place, waste management companies will need to get creative with the space they have, as they no longer have a backup plan. Safety is another issue that has always been a concern in the waste management industry, with workers facing risks involving emissions from the waste, pollution, equipment safety dangers and hazardous materials. However, fatality rates are decreasing thanks to improvements in technology such as cameras and sensors. Within the private waste and recycling industry, the number of fatalities from 2015 to 2016 decreased from 50 to 42, according to the Bureau of Labor Statistics and as technology continues to improve, the number of fatalities in this industry should continue to decline. But safety is not the only issue in the waste management industry that advancing tech can improve. Technology has also helped solve other problems, such as safely gathering data to drive better decisions and monitoring the landfill for potential problems such as gas leaks, hot spots or compaction. There is still room for improvement in these areas, but by making the most of the new technology available, waste management executives can solve a host of problems that are plaguing the industry. 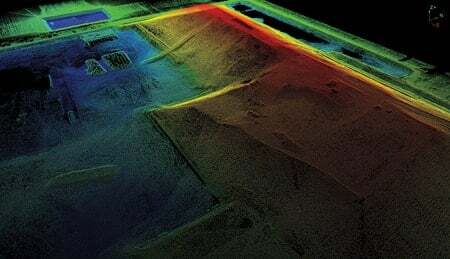 A Lidar point cloud scan of a client landfill. When it comes to maximizing the capacity of a given landfill, density and air space are two of the most important metrics that managers can measure because they determine how much space you have available. When you make these measurements more frequently, it is easier to make adjustments over time that increase density—and technology makes it easier to take these measurements on a regular basis. Air space is an important resource, and new technologies can help waste management executives stay apprised of minor issues before they become major ones. Drones, for instance, can provide early detection of hot spots by performing a thermal inspection. Then, once they are armed with reliable data from the drones, managers can take the necessary steps to avoid subsurface fires and the resulting air pollution. The new suite of waste management tools centers around data; instead of leaving managers in the dark, technologies provide them with the information necessary to make the most informed decisions possible. The following are some of the most important steps for managers to take in order to pull their landfills into the 21st century. One of the most exciting capabilities that has been unlocked by drones is the ability to create 3D maps of a landscape.4 A 3D map not only allows you to make better decisions by surveying the landfill, but it can also help you frequently update densities and then adjust your operations to increase density—therefore, expanding the life of the landfill. Drones can also help you discover and correct common problems in a more cost-effective way. For example, they can help you determine whether there is any soil erosion or vegetation in landfills (which is particularly helpful at closed landfills), and 3D mapping of the entire facility can help you decide when it is time to upgrade your equipment. One of the biggest safety concerns at landfills is the risk of a fire. Whether caused by a spark from a chemical reaction or the introduction of live embers with waste, fires can ignite easily and go unnoticed for days with conventional monitoring methods. Mounting thermal cameras on drones can help combat this persistent threat by allowing managers to locate and address hot spots well before they burst into flames.5 These cameras can even catch high-risk waste (like barbecue ashes) on its way into the landfill before it can interact with other flammable materials, which can prevent potentially deadly disasters. Many modern landfills offset their operating costs by capturing and using gases such as methane. All too often, however, leaks in the collection system can cripple profits while introducing dangerous pollutants into the atmosphere. Especially for the largest landfills, finding leaks used to be a difficult and expensive undertaking. With gas detection sensors mounted on drones, however, landfill managers have a cost-effective method of spotting and addressing leaks before they can have a severe impact on a company’s bottom line. Modernizing your landfill is not an operation that is going to happen overnight. It takes time, technology and, perhaps most importantly, the right partners. Experienced service providers will have the skill set to seamlessly incorporate futuristic technologies into your existing workflows, allowing you to capitalize on data collection as quickly as possible. Lauren Elmore is the president of Firmatek (San Antonio, TX), a leader in the mining, construction, and solid waste industries that specializes in using drones and data collection to solve problems related to inventory and stockpile measurement, mining and solid waste mapping, and construction and engineering work. Lauren is also a Stanford University graduate with a degree in economics, and she was a member of the Stanford Women’s Gymnastics team. She can be reached at lauren.elmore@firmatek.com.